IAM RoadSmart is offering a unique chance to win a place in pioneer biker Maria Costello’s women only bike track day group coming up soon. The Hel Performance/Maria Costello MBE women only track day group takes place on 20 September at Donington Park and IAM RoadSmart is holding a prize draw to give away a free place to one lucky rider. Maria’s track day is a rare opportunity to ride with her and other female bikers, and receive tips and advice to help all attendees improve their riding skills and confidence. The chance to ride with Maria is not one to be missed. 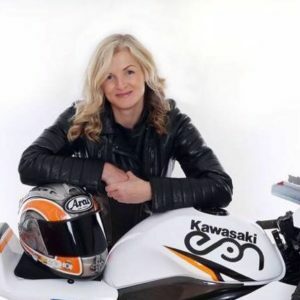 The ‘Queen of Bikes’ has made more than 40 starts at the Isle of Man TT and became world famous as the first women ever to claim a podium on the island – with third place in the Ultra Lightweight category of the 2005 Manx Grand Prix. Her career spans two decades, with 2016 proving the most successful yet. She scored the female lap record at the Vauxhall International Northwest 200 plus a podium alongside 23 times TT winner John McGuinness in the Isle of Man Senior Classic TT. For five years Maria held a Guinness World Record at the Isle of Man TT, when she lapped the Snaefell mountain course at an average speed of 114.73 mph in 2004 – thus becoming the fastest women to have done so. For a chance of winning a place on Maria’s track day with IAM RoadSmart, simply email your name, address and phone number to events@iam.org.uk by noon on 15 September. No need to answer a question – just a simple prize draw.